Keep an eye on my blog for the next few days because I’ll be sharing some 2017 printables to help you get organized! I shared some last year and they were popular. People have been emailing me asking if I’ll be sharing new ones and the answer is YES! I hope they help to keep you on track in the new year. Today’s free printable is a 2017 Yearly Calendar. 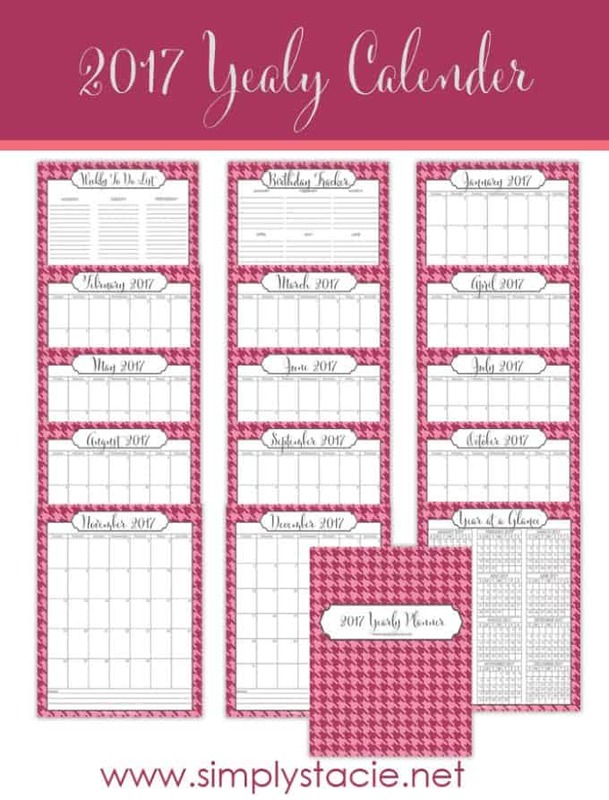 It includes a Weekly To-Do List, Birthday Tracker, Monthly Calendars and a Year at a Glance Calendar. Download the pdf to your computer and print off at home. I keep mine in a binder stored in my kitchen. Click here to download your 2017 Yearly Calendar Printable. A good calendar keeps me on track. Thanks for this one. Thanks for the free printable calendar. I sure can use it and I like that it is free! Happy Holidays!